A lot has changed in the last century and a half. Instead of natural seeps or drilling four meters down, wells today are typically drilled anywhere from 500 to 4,000 meters deep or more, plus up to another 2,000 meters horizontally, and then often fracture stimulated with an immense amount of fluids pumped into the formation to crack open the rock. The industry has also grown substantially from supplying fuel for kerosene lamps to today producing more than 92 million barrels per day of petroleum globally that fuels our cars and airplanes, heats our homes and offices, builds our roads, and benefits us in many other ways. One thing has not changed: at the end of the day fundamentals of supply and demand determine oil prices. OPEC, geopolitical events, and a wide variety of other factors have a material impact on prices, but only because they affect current or future expectations regarding supply and demand. One of the key takeaways from this commentary is that supply response to lower oil prices is in full force. Oil at US$50 per barrel is below the price required for new wells to be economic for effectively all of North America and many projects globally. Capital expenditures by oil companies around the world have been slashed due to lower cash flow and now uneconomic projects. A recent report from RBC estimates that for the companies in its universe global spending for 2015 is down $86 billion from 2014 levels. The same report also estimates cash flows will be down an even more incredible $140 billion, which implies that further capital expenditure cuts are coming. 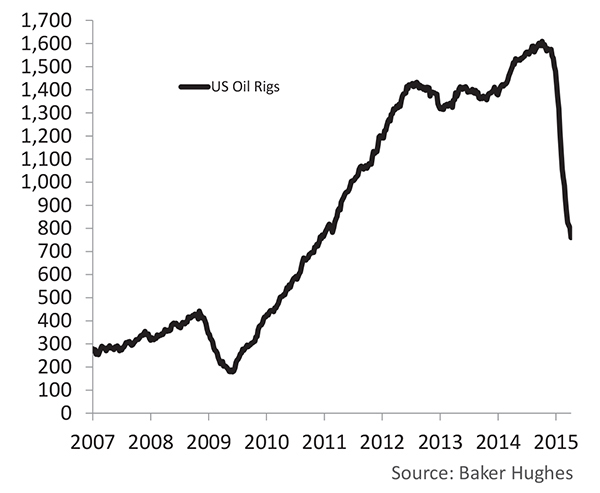 The capital expenditure cuts are showing up in the rig count. The number of rigs drilling for oil in the U.S. is already down by 53% from the peak in October 2014. In Canada, there are currently just 20 rigs actively drilling for oil, and while we are in the midst of spring breakup, it is still 82% lower than this time last year. It is only a matter of time before lower capital expenditures translate into lower production. The wildcard is the decline rate of production from recently added wells. Beyond just the rig count, which is a relatively short term dynamic and puts the spotlight on North American shale producers, the crash in oil prices also impacts long term supply around the world. A number of the world’s mega projects - the ones that cost billions of dollars and were expected to each supply as much as hundreds of thousands of barrels per day in the coming years – have been deferred or outright cancelled. Whether it is a cancelled oil sands project in Canada or a deferred offshore development in Africa, South America, or the North Sea, the loss of these future barrels will have a significant impact on future supply. Long term, this will likely prove to be more important than the market’s current focus on near term U.S. production and inventory levels. The story line for the precipitous drop in oil price has been a one-two punch of too much supply and slowing demand growth. While supply gets most of the headlines and blame for the crash, slower growth in demand and in particular expected weaker Chinese demand, provided the proverbial wet blanket that these low oil prices will persist for a long period. The facts are not supportive of ‘weak demand’. Over the last year, the IEA has revised downward its estimate of world demand growth due largely to lower expected growth in China, India, and other important oil consuming countries. That said, global oil consumption is expected to grow by approximately 1 million barrels per day in 2015 and further demand growth is expected in future years. Also of note and Economics 101, demand increases when prices decline. That demand response is starting to appear. 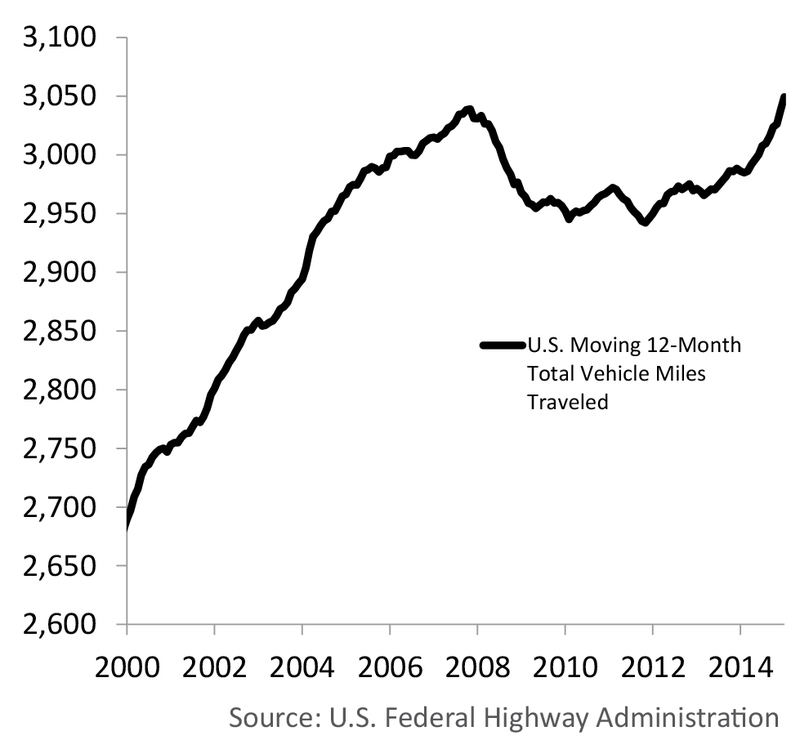 For one example, there has been a substantial increase in vehicle miles driven in the U.S. since the decline in oil prices started last summer. A potential catalyst to oil price and energy markets will occur when demand growth forecasts are revised upwards. The current supply / demand imbalance is correcting in the normal course of reduced capital expenditures, reduced activity, and ultimately reduced production. During this low price environment, business strategies are stress tested to the extreme and there is a cathartic reaction of the strong getting stronger and the weak getting weaker. One sign of this reaction is an increase in mergers and acquisitions; a sign we are currently witnessing in the Canadian energy sector. Another sign is a singular focus on cost efficiency, which has the dual results of margin squeeze for service providers and improved cost structure for the producers. The key takeaway is that the Canadian energy industry is becoming leaner and meaner and has tremendous leverage to oil price increases. An oft asked question is how long before the oil price rebounds. Historically it has taken about a year for the ‘normal course’ to run. Looking back at 2008 it was just over a year for oil to go from over US$100 a barrel to US$31 per barrel and back to US$80 per barrel. Similarly in 1998 we went from oversupply to undersupply in less than a year and oil price teeter-tottered. Today, complicating the normal course is the fact that more than two-thirds of the world’s oil production is in countries suffering from various degrees of civil unrest. While a supply disruption is not something that we count on, it is certainly a scenario that could move oil prices higher in a hurry. There were ~30% swings in oil prices in both 2011 and 2012 due in large part to disruptions in Libya and the North Sea. Timing the turn in oil prices is an imprecise art. What is more important to us during this low price environment is to invest in those companies that can still create value for their shareholders. In the Norrep Energy Class, the portfolio consists of our best investment ideas in energy companies that will not only survive this period of low commodity prices, but will use it to take advantage of weakened competition and come out of this even stronger. The recovery will be a bumpy ride and there are still risks to the downside, but as commodity prices recover and the downturn ends (and keep in mind the market is forward looking so equities can turn well ahead of commodity prices), we believe there is significant upside for the companies in the portfolio. Capitalize on our Calgary-based expertise and industry relationships with the energy focused Norrep Short Duration 2015 Flow-Through Limited Partnership (FTLP). FINAL CLOSE Friday May 8, 2015. Tickets accepted till noon on May 7th, 2015. Don't miss out on the tax advantaged way to build positions in any of Norrep's award winning ​fund line up. The Norrep Short Duration 2015 Flow-Through Limited Partnership is only sold by prospectus. The prospectus contains important detailed information about the securities being offered. Copies of the prospectus may be obtained from Norrep Capital Management Ltd. or any member of the syndicate. Investors should read the prospectus before making an investment decision.